This sequel to Landvik’s debut novel (Patty-Jane’s House of Curl, 1996) reads easily as a stand-alone. A light read—not deep, but definitely wide—the story follows Ione Rolvaag’s family (and friends) for two decades. The Rolvaag family, from matriarch Ione on down to her great-grandchildren, lives, laughs, and loves at Blue Moon Lodge. In a nutshell, Ione gets a second chance at the love of a lifetime. Her daughter-in-law, Patty Jane, can’t marry the man she loves because her legal husband, Thor, has returned, brain damaged, after a 15-year absence. Nora, Patty Jane’s (and Thor’s) daughter, has a one-night stand that leaves her more than surprised (three guesses), but in this basically optimistic tale, she finds love, too. And her kids, and those of her half brother, turn out well, so happiness overrides the sad events that are spattered throughout. Nora’s newly acquired Blue Moon Lodge in rural Minnesota is the focal point for the action, a cozy place where friends and family gather. The novel’s lengthy time frame slows forward momentum. There’s no definitive plotline, just four generations living, loving, learning, and struggling through the occasional hard times over a span of 20 years. It’s a story about family—but chock full of other characters, too, and much dialogue. There is a charm and warmth to this hopeful tale in which love is the glue that holds people together. There is no apparent main character; each shares the spotlight in a short scene before the curtain drops and another’s stage is set. 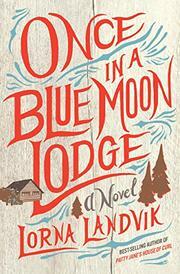 Landvik’s love for her characters is evident; she introduces multiple peripheral people, who serve as color in the backdrop of a close-knit family, and she has clearly thought deeply about the people she puts on the page. She even provides a detailed epilogue to show where life takes them after the book is closed. A people lover’s book. Characters grow and change; family and friends support each other. Predictable, but comfortably so, this refreshingly simple family tale provides a comfy diversion from the everyday world.